Rodeo Competition Top Boot. With double strength Rawhide covered Heel Counter. Close edge Trimmed and cut down V in shaft for easy removal when caught. 2.2mm Australian Bull Hide upper with 1mm leather Lining. 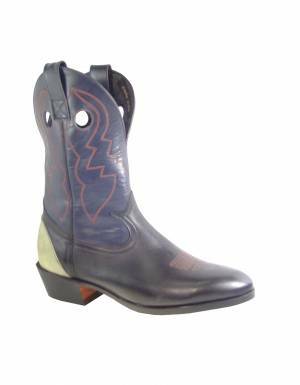 14 iron Leather sole and stacked Low shape Cuban Cowboy Heel. Leather, Dipped and Raw Hide Heel stiffeners with spur rest. Especially toughened for the Professional Rodeo Rider. Poron padded footbed & 3/4 leather sock.